What Is The Mr. George Gold Coin? We at Publix pride ourselves on providing customers with premier service each and every day. Because of this, it should come as no surprise to you that we love to hear stories from our customers as well as other associates when someone really goes above and beyond his or her job expectations. Since we so often receive these kinds of praises from all over the company, our late founder George Jenkins, affectionately known as Mr. George, decided to design a recognition program that acknowledges those associates who step past the call of duty to really make a customer feel valued. The program was first introduced by Mr. George in 1955 to recognize the exceptional examples of outstanding service by presenting them with what back then was a silver 25th anniversary coin. Over the years, the silver service coin has gone through many versions. One of the biggest changes occurred when the coin was switched from silver to gold to emphasize the importance and honor an associate should feel when presented with the award. This year, the gold coin takes on a new design and packaging that will act as a keepsake for the associates being honored. As an added thank you, not only do award recipients receive the gold coin, they also get a message from our CEO, Todd Jones, and a Publix gift card. Recipients of the coin should feel like they’re being recognized directly by our CEO, because that’s exactly who has final approval over each and every award given. 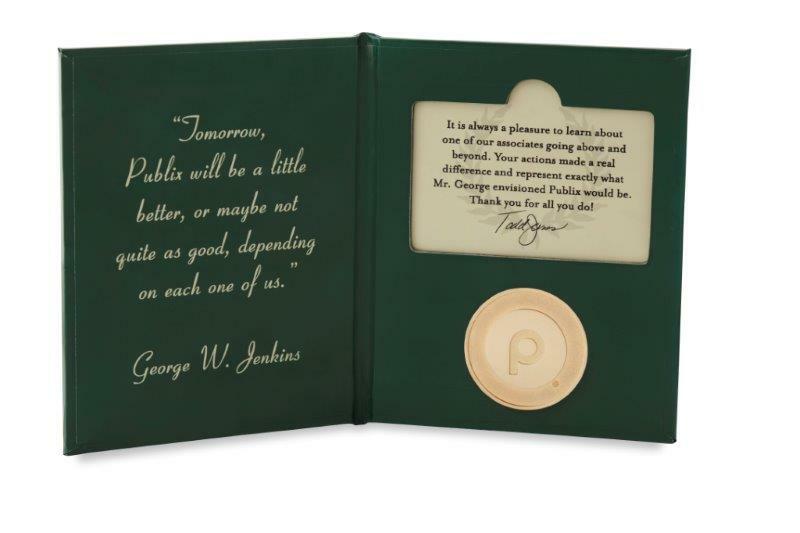 This coin represents the associate who truly embraces the Publix culture and provides premier service just like Mr. George himself would have. To receive this award means you’ve done something pretty special and special is exactly how you should feel. Although we’ve gone through many versions of the coin since the program’s inception, the meaning behind it has remained the same and is still very much alive today. Now that you have a firm understanding of what the Gold Coin Recognition program is and how it all began, I bet you’re eager to read some awesome stories about our associates. In the past, these stories have been kept internal, only being shared with other associates through our monthly newsletter. Today we are excited to announce that we will begin featuring a new Gold Coin story with you, our readers, every month right here on our blog! Have you ever witnessed an associate truly going above and beyond at your local Publix? You better believe we’d love to hear about it! Share your story with us on Facebook, Twitter, via our contact us page, or give our Customer Care department a call at 1-800-242-1227. No matter which method you choose, your story will be reviewed by our executives and taken into consideration for a Gold Coin award. So wonderful that Publix never loses sight of the values of their founder Mr. George. Wish I could have meet him. He left hug shoes to fill, but his legacy is incredible. At Publix shopping isn’t the only thing that is a pleasure, but for so many of your employees working is too! Congrats and keep up the good work! Thank you so much for the wonderfully kind words, Jim! I love the idea of having a recognition program for employees that go above and beyond. More than anything else people want to be appreciated for their hard work and dedication, no matter what their job classification may be. Keep up the good work, Publix! We’re so happy to hear that you like the idea, Guadalupe! You sure hit the nail right on the head. Thanks for visiting The Publix Checkout!